No matter what you write—novels, emails, tech specs, job aids, chart notes—you need a solid understanding of English grammar, usage, and style to create clear, strong content. This class covers basic concepts such as parts of speech (nouns, verbs, adjectives, etc.) as well as common conventions, punctuation, word usage, and style guides. Whether English is your first, second, or eighth language, this class will help you learn (or re-learn) some of the rules that can easily elude even seasoned writers. For instance, we will cover comma placement, how to distinguish between a noun and a pronoun, agreement errors, and common word usage errors. (Pop quiz: what's the difference between affect or effect?). 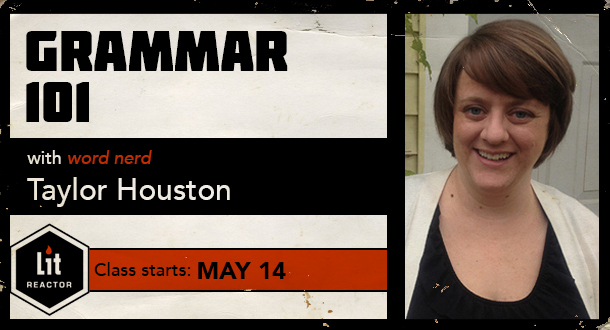 This class is open to writers of all levels and interests. It doesn't matter if you're a published scholar or a worker bee with a lot of e-mails to write, there's something for everyone—after two weeks, you'll be a stronger, more confident writer. The curriculum will include readings, worksheets, short writing assignments, and discussions. In this class, we will spend a significant amount of time learning what it takes to create a sentence—subject + verb + optional object. We’ll cover parts of speech like nouns, pronouns, verbs, adverbs, and adjectives, and we will practice how to identify and use them correctly. We will look at how to form verbs (conjugate) depending on who and when. We will also learn about independent and dependent clauses and how to use them. We will study the basic punctuation marks like the period, the comma, and the semi-colon. We will talk about how to use these to create clear, functional sentences. Emphasis will be on commas as they are one of the most misused punctuation marks in the English language. This class will also cover a smattering of other useful but often misused conventions that can weaken your writing when not used appropriately, such as the basic rules of capitalization, how to refer to numbers in text, how to form plurals, and how to check writing for agreement (subject/verb/number/gender/tense), etc. We will cover some of the most misused and mixed up expressions. We’ll also talk about how to determine the best word and avoid collective bad habits. We’ll also talk about how to enliven your prose by choosing the best words and eliminating fluff words that water down your message. We will talk about what “style” means in terms of grammar, word usage, punctuation, etc. The rules of English grammar and usage are not hard and fast. They can change depending on the context, the intended reader, and the structural logistics of a piece of written work. We will talk about style guides and how to use them with your new knowledge of basic English grammar.